For each day of the year we chose a short text by Father Triest. These are words he spoke or wrote. They offer a good insight into the richness of his spirituality and can still inspire us today. Read this publication on the left or download the PDF file here. On various occasions and on certain themes, Father Triest formulated customized prayers. These are windows into Father Triest’s deep prayer life. Read this publication on the left or download the PDF file here. You can find here a booklet for each day of the month with a text of Father Triest, a reflection and a prayer. Read this publication on the left or download the PDF file here. During the novena, we remember the most notable features of his life and we pray that we too may live more in this spirit. Read this publication on the left or download the PDF file here. 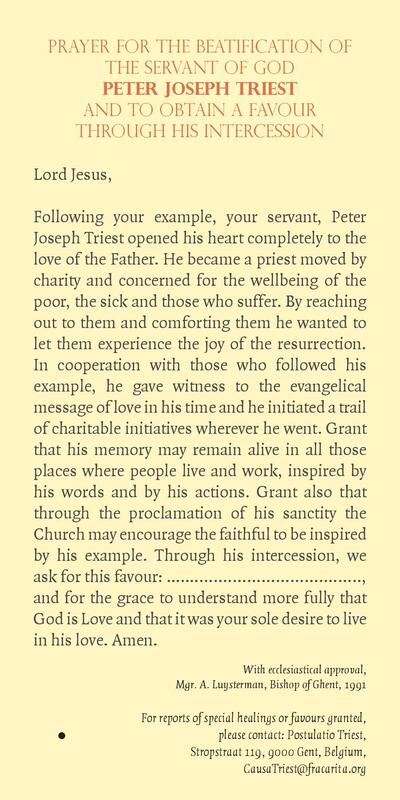 Prayer for the beatification of the Servant of God Peter Joseph Triest and for a favour through his intercession.